The importance of characterizing your random inputs and their influence in your probabilistic process. So its time for a new message in the blog about work. I told you before that I was looking at these very cool models called Kriging models. Well, I m still looking at them, but now I have been inveting some time on the analysis if their design of experiments, or, the variables that are used to create the model that, lets say, stay on our x axis (y axis will give the output, just imagine a 2D curve). Why is it important to look at these variables before any further progress? I have the surrogate model, I have the means to compute the results, why spend some time doing tests with these variables? Well, maybe you don't need, but lets see why it is important. When you run an experiment some variables affect much more the output of your experiment than the other. So, if a variable is 98% responsible for the variations in your output why should you consume your time looking at the other variables. You just do it once, you quantify these relations between variables and then in future experiments you now "whats happening". This is of particular interest in the case where you're going to repeat your experiments a lot! But do not forget, this preliminary analysis, usually called, sensitivity analysis, needs to be very well done. Otherwise you may neglect important effects. Like coupled effects or similar. So, you spend some more time in this and in the future you just save some time. We just need to believe that the balance will be positive. And it is very likely to be. In cases where budget and time is a limited resource (in other words, always), this can be very interesting. I believe and I heard it many times before from big scientists that, no additional complexity should be added to the analysis if it is not needed. Or, that "simple is beautiful". In the case of Offshore Wind Turbine Towers there are many many variables that affect the behaviour of the turbine. As a very complex technology, its analysis is time consuming, so, characterizing well the different variables that affect the turbine is important before going on loops trying to do new things. Basically, before trying intensive research ! Even more when you work on probailistic research, quantifiying uncertainty adds a new layer of complexity and effort, so this is even more important. To analyse the influence of the different variables there are many different techniques, Screening, Sobol, Anova, KL divergence, you can find many in the literature. Also, different techniques exist to simulate experiments, as the simple Monte Carlo or the Latin Hypercube Sampling. If variables ar correlated it gets a bit more complex, but still feasible. You can find many of them in literature. Well, all this just to tell you that despite looking a secndary task from your main topic, or boring in some way, sensitivity analysis are very relevant and they can be a milestone when you're doing research in terms of saving time and resource and in the end your skin. Its like that subject that you're never into during the university but suddendly when you start working you realise it is much harder than it looks and much more important. I know I know, some of you will now say....I didn't need 95% of the university courses.... bu this one for sure you needed and for sure it was diluted in the many different courses and you probably never had it to its full extent. I recomend some reaidng on the topic. Very interesting indeed! 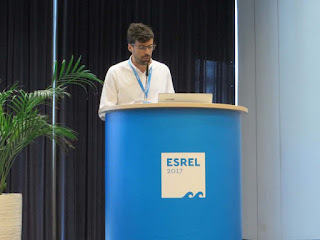 Just last month was the ESREL conference and I had the opportunity to participate and present some of the work that I have been developing on OWT reliability. ESREL its quite a big conference, probably the biggest or one of the biggest in Europe about reliability. I have to say that it was an interesting experience, met lots of interesting people. Other ITN students (working on wind turbines...wow), which makes me happy to see such an interest in reliability and addressing uncertainty for OWT. But mostly, the opportunity to interact in an international conference and present some work, reuniting some good comments, good contacts, that was great. Next I will be at home, Madeira, for a Conference in September called ICSI2017. I hope at least so interesting as this one. It looks like in renewable energy we are going back in time (in fact in everything not only renewable energy) and we need to work together to fight some of these ideas/seeds that are being implemented slowly on people heads. Some time ago I saw this amazing video by Neil deGrasse Tyson (below), one of the most outreaching persons in science that always has one of those arguments in the sleeve. I think it mirrors how surprising in a negative sense is this discussion over science, global warming and everything. I believe, and believe well applied here, that it really looks silly when you hear all these arguments that contradict some scientific facts. It is true that science can be wrong, and it happens, but just the fact that people identify patterns in their studies, that means that something is happening there and it does not matter if it is important or not on a first phase. Some people criticize how science is made, and on how some studies are accepted with low confidence and all that but in fact that is not true. And that thing of fake results does not exist. See the example, one of the most prominent guys of anti-vaccination was caught in the past because of its biased results...and lost his degree. So that myth does not exist. Lie has short legs. And shorter than usual in science. You cannot say that you do not believe on a scientific fact. That just does not make sense. You can choose to believe or not in many thing, just not on science. Its not a matter of whether you believe or not. Please stop that. If you really don't "believe" in the global warming by human hands (apart from other effects we are indeed accelerating it) or vaccines or whatever and on the importance of the renewable energy, please go read a bit about it. I challenge you to do some science to prove the contrary. And make it accepted by a renowned entity !